Twitter global usage - 168 million monthly visits! App traffic is 80% of Twitter use, the monthly visit figure is much higher than we thought! A while back Neville Hobson used various Twitter stats to try and work out the actual number of monthly visits and estimated that Twitter was getting around 60 million monthly visits when web traffic and app use was combined. 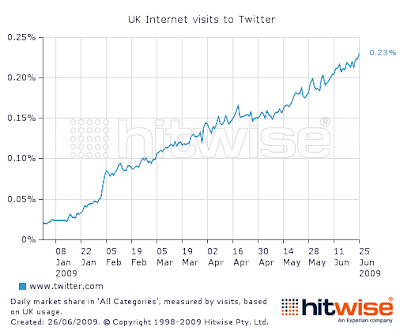 So why do I think Twitter is getting 160 million monthly visits? But what about the Twitter Apps? This traffic isn't included in any of the Hitwise or Comscore figures. What would Twitter monthly traffic be if app use was factored in? 80% of Twitter traffic comes through Twitter Apps! 80% of Twitter use is not picked up in Comscore or Hitwise Twitter traffic figures. This means that everyone has been grossly underestimating Twitter usage. Neville was conservative with 30% traffic through Twitter apps to get to his 60 million figure in April. Well thanks to the information from Evan Weaver in the Guardian we can safely assume that monthly visits to Twitter are now in excess of 150 million and if my flaky maths methodology above is to be believed, Twitter global monthly traffic could now be sitting as high as 168 million monthly visits!